The ABC entrepreneur reality show Shark Tank has some successful food products to its credit, like Wicked Good Cupcakes and Cousins Maine Lobster. This next one sounds a bit unlikely, but is already on supermarket shelves nonetheless. Delighted By Hummus is in fact based in chickpeas, but uses that usually savory base to create “dessert hummuses” like snickerdoodle, vanilla bean, brownie batter, and choc-o-mint. 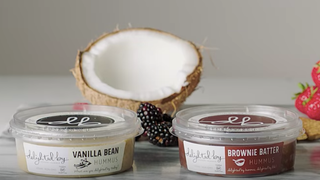 Insider has done a taste test already and is pretty enthusiastic, calling the product “guilt-free brownie batter in a tub.” After all, in addition to chickpeas, it contains coconut oil, water, coconut milk, organic turbinado sugar, and sea salt. Product creator Makenzie Marzluff states on the company’s website that “Delighted By’s mission is to inspire people to spread their glitter. In other words, to be the light they are out in the world.” We believe we’ve made our feelings about glitter perfectly clear, but that doesn’t mean that we wouldn’t be happy to try dipping some apple slices into some snickerdoodle hummus for a healthier snack that hopefully our kids can get behind.